Validated in over 300 clinical studies, motivational interviewing (MI) remains the most patient-centered and effective approach for supporting better patient engagement and activation, disease self-care, treatment adherence and lifestyle management. This is the first MI video training series especially designed for clinicians who serve individuals at risk of, or affected by, chronic diseases. Whether you are serving in a wellness, disease management, or care management program—or a primary or specialty care setting, hospital or community program—this series will help you build the practical MI knowledge and skills you need to support your patient health and address the behavioral factors that are responsible for over 85% of avoidable health care costs. Purchase the two-DVD set now for $149 (plus $7.95 shipping & handling). Special pricing for bulk orders is available for MINT trainers or organization purchasers: Order 5-9 ($120 each); 10 to 24 ($99 each); 25+ ($75 each). 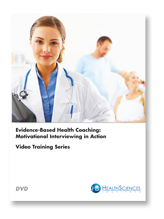 In this 14-part interview series, NIH-funded motivational interviewing (MI) authority Dr. Susan Butterworth, and behavioral medicine expert Dr. Blake Andersen, discuss why validated, MI-based health coaching approaches are essential for addressing the health-related behaviors that pose the greatest threats to health and drive 85% of avoidable health care spending. Success factors, strategies and practical applications of MI in usual health care, chronic care and care management settings are explored.